RayBio® EIA kits utilize the principle of Competitive Enzyme Immunoassay (EIA), in which the target protein and a biotin-conjugated peptide bind competitively to a capture antibody. This assay requires only a single antibody, generating signal output by interaction of the biotinylated competitor with streptavidin-HRP. 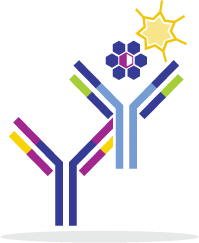 Thus, the EIA kits are particularly useful for detecting peptide hormones and other molecules for which no antibody pair exists, or for which antibody pairs cannot be developed. RayBio® Human/Mouse/Rat Visfatin EIA Kit optimized for serum and cell culture medium. Competition-based ELISA on a 96-well strip plate. RayBio® Human/Mouse/Rat ZAG EIA Kit optimized for serum and cell culture medium. Competition-based ELISA on a 96-well strip plate. RayBio® Human/Mouse/Rat Adiponutrin EIA Kit optimized for serum and cell culture medium. Competition-based ELISA on a 96-well strip plate. RayBio®Human/Mouse/Rat Amylin (IAPP) EIA Kit optimized for serum and cell culture medium. Competition-based ELISA on a 96-well strip plate. RayBio® Human/Mouse/Rat Angiotensin II EIA Kit optimized for serum. Competition-based ELISA on a 96-well strip plate. Optimized for serum and cell culture medium. RayBio® Human/Mouse/Rat Apelin EIA Kit for optimized for serum and cell culture medium. Competition-based ELISA on a 96-well strip plate. RayBio® Human/Mouse/Rat Brain Natriuretic Peptide EIA Kit optimized for serum and cell culture medium. Competition-based ELISA on a 96-well strip plate. RayBio® Human/Mouse/Rat Cocaine- and Amphetamine-responsive Transcript EIA Kit optimized for serum and cell culture medium. Competition-based ELISA on a 96-well strip plate. RayBio® Human/Mouse/Rat Catestatin EIA Kit optimized for serum, plasma and cell culture supernatants. Competition-based ELISA on a 96-well strip plate.